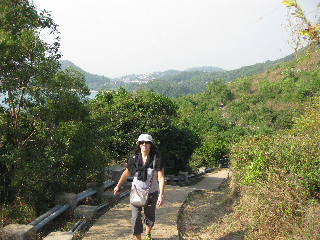 One of the goals of this trip to Hong Kong was to explore the further reaches of the territory. 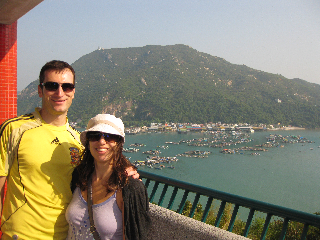 So today we got onto a ferry and went to Lamma Island, a small island about a 30min boat ride SW of HK. Cruising west out of Victoria Harbour it is interesting how the dense concrete jungle suddenly ends at a steep hill at the sea's edge and is replaced by thick green vegetation. You're reminded that you are in fact close to the tropics. Leaving the rows upon rows of 40-storey apartment buildings behind, we pull into Yung Shue Wan that has just a smattering of 3-storey buildings. Disembarking and walking along the quiet main street (you can actually hear birds chirping!) it feels as though we went from downtown Toronto to small-town Manitou. Except here there are large tanks of fish, abalone, scampi, clams and prawns at the side of the small street and there are no vehicles, aside from these neat little lawnmower engine-powered trucks. Our purpose here is to do a walk from one end of the island to the other. 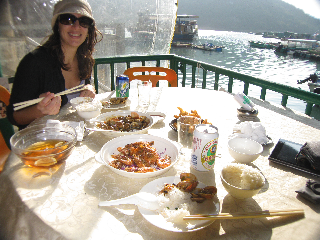 Julie got the info from discoverhongkong.com and it said it would take about 4hrs. We got a little bit lost at first trying to get out of the village (having a GPS-enabled tablet is pretty handy!) but we found it, and armed with a waffle slathered in peanut butter and condensed milk, we wandered off down the sidewalk in the shade of the large trees. Shortly a beach comes into view and with the sun trying to burn through the clouds, it's almost tempting to take a dip, but the sign that says "stay within shark net" makes one think twice. After the beach the path goes upwards out of the trees and into the drier grasslands. We stop for a snack at one of the half-dozen pavilions (rest shelters) that dot the route. 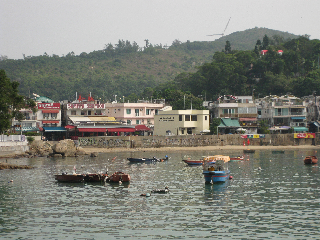 Coming down out of the hills a final pavilion offers a grand view of the bay and the village of Sok Kwu Wan. Walking through the village, seafood restaurants hawk their catch with the catch phrase that the ferry doesn't leave for over an hour - enough time for lunch! We take the bait (pardon the pun?) and sit down at a seaside place after the lady convinced us of her set menu lunch and julie bargained for some sweet'n'sour. HK$198 got us a plate of clams (slathered in a tasty spicy black bean sauce), shrimp, calamary [sic] and our first taste of abalone, served in the shell. We actually had to get the server to get the meat out of the shell for us since we'd never done it before. The sun came out and it was quite nice sitting there next to the boats bobbing in the water. Couldn't enjoy it for too long as we had to chug the final bites and dash to the ferry.